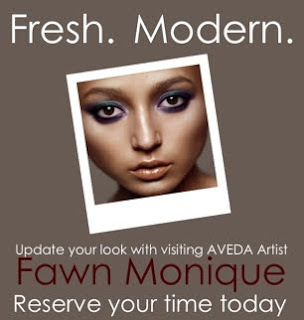 Join us May 25th and 26th, Fawn Monique, an Aveda Purefessional, will be taking appointments at our Coconut and Naples locations. Wednesday, May 25th, Fawn will be at our Coconut Point location, (which is in Estero, Florida)between 2-7p.m. Fawn will be consulting with our guests at our Naples, Florida location Thursday, May 26th between 10-4p.m. Not sure how to do your makeup? This is a once in a lifetime opportunity to have a one-on-one consultation with a NYC Runway Makeup Artist. A $25 reservation fee will hold your 45 minute consultation time. That $25 will go towards any makeup or skin care products you purchase during your appointment. Call 239-498-5004 to Reserve your Appointment at our Coconut location Wednesday, May 25th. Call 239-434-6722 to Reserve your Appointment at our Naples location Thursday, May 26th. We hope to see you at our Shake Up Your Makeup Event! Come Experience the Difference.